In the midst of summer heat, I love to use my crock pot to cook the season’s ripe vegetables. My kitchen stays cool and my taste buds get to dance. This week, I had friends bring me fresh beets from their community CSA. I love roasting beets in a little bit of olive oil, salt and pepper, so I thought this would be a fun challenge for the crock pot. When you roast beets in the oven, there is the chance of overcooking, resulting in a dried, wrinkled sad result for this moist and vibrant treat. With the locked-in moisture of the crock pot, I really think that beets get the chance to both marinate and cook to perfection. Please note— this recipe calls for FRESH produce. This recipe is not intended for canned beets. When you are preparing fresh beets, be cautious that the juice doesn’t dye your hands, your counter or your cutting board. But you will benefit greatly by doing the preparation, because the taste and texture of using fresh produce for this recipe is so much better than you could ever replicate with a canned product. Put all ingredients in crock pot and stir together. Cook on low for 4 hours. 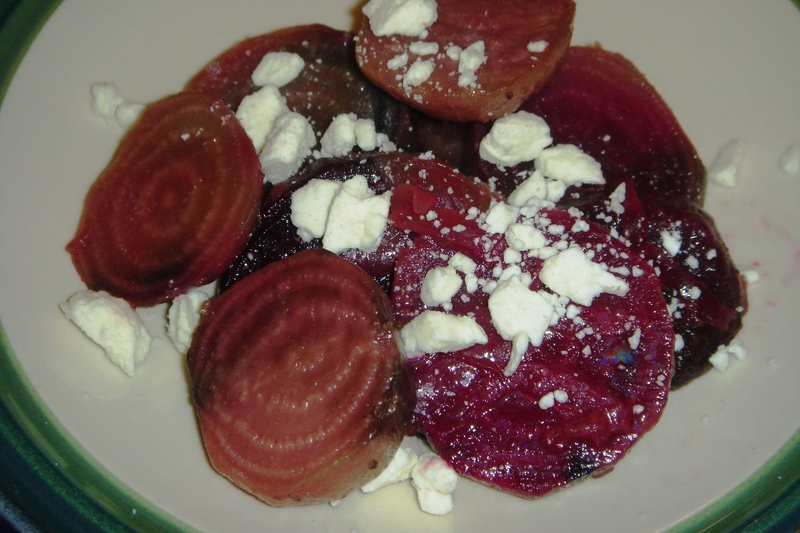 After beet salad cools, transfer and refrigerate until salad is cold. When serving, top it with 1/2 c. crumbled feta cheese.